Miami is a place of many guises. There is the hyperreal Miami of Miami Vice, of alligator attacks and Elián González. There are splashy art galleries and celebrity hotels. There are also lots and lots of strip malls. But this collective weirdness happens to sit on one terrific piece of real estate. Miami has turquoise waters and white-sand beaches. It also has gleaming Modernist architecture and impossibly beautiful people. Joan Didion once described the city as having a "kind of perilous attraction." And it does. You can lose yourself here, among supermodels, nostalgic Cubans and the countless figures who live on the fringes  and remind us that until a few decades ago, this was all still frontier. Like most modern American metropolises, greater Miami is composed of several smaller cities. Here the cookie-cutter developments all tend to blend into one indistinguishable mass of peach stucco and Spanish tile. For the purposes of navigation, however, the city is essentially divided in two: Miami, the mainland city, which is businesslike in demeanor, with offices, malls, arts districts and residential subdivisions; and, connected to the mainland by causeways to the east, Miami Beach (a.k.a. South Beach, a.k.a. SoBe), the slim, glamorous barrier island that is draped in Deco hotels and where life is lived as if it were one big party. If you have only a few hours to spare, choose one side of town and stick with it  or you may end up spending all your time sitting in traffic. 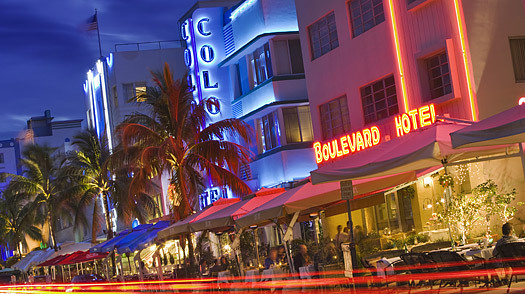 Miami Guide: Find travel deals, hotels and more!